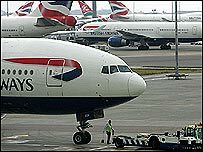 A US judge has upheld a $300m (£150m) fine against British Airways (BA) for price fixing after a guilty plea. The case was heard by a judge in Washington, who had to formally approve the fine which was recommended in July by the Department of Justice. BA now faces the likelihood of a class action lawsuit by thousands of US customers who were overcharged. The airline had tried to fix the price of fuel surcharges on US flights in collusion with Virgin Atlantic. "As I have previously stated, any anti-competitive behaviour is to be condemned at British Airways or at other companies," said BA chief executive Willie Walsh after the judge's verdict. "It will not be tolerated and we remain vigilant in this respect." BA could have faced a US fine of up to $900m, but the Department of Justice credited it for co-operating with the inquiry. The American fine followed a detailed investigation on both sides of the Atlantic. Investigations in the UK were led by the Office of Fair Trading (OFT), which has already fined BA £121.5m. As rival Virgin Atlantic tipped off the OFT about the price-fixing scandal, it was granted immunity. It was the first time that the UK and the US have simultaneously brought action against a company. BA had colluded with Virgin Atlantic on at least six occasions between August 2004 and January 2006, the OFT found. During that time, fuel surcharges rose from £5 to £60 per ticket.